What's the worst thing that can happen if you neglect to make backups of your data? Do you know the most annoying word in the English language? And can you make big money by extracting precious metals from discarded cell phones? Find out... in today's Geekly Update -- it's jam-packed with the latest tech news. And it's *guaranteed* to make you 146% smarter. Read, think, and, comment! "No offense, but… that's annoying!" A yearly poll by the Institute of Public Opinion at Marist College reveals the words or phrases that Americans found the most annoying in 2016. For the 8th year in a row, the word "whatever" topped the list. KFC restaurants in China are testing face recognition tech in kiosks that size up a customer by age, gender, weight, and apparent mood to decide what food items to recommend. "Computer says... Chicken, mashed potatoes and gravy for you!" A landlady in Braubach, Germany was concerned about chemical odors coming from her tenant's apartment. She called police, who suspected a drug lab. 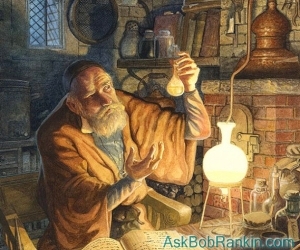 Turns out he was an amateur alchemist, trying to extract traces of gold from old cell phones. ePay, a Florida payments processor startup, learned the importance of backups the hard way. Its CTO left in a huff, and he was the only person who knew the passwords to the company’s website and software development vault. The last customer to desert the paralyzed ePay was a preschool, which cut ties after the domain expired and was snapped up by a p**n site. Uber has pulled its self-driving cars from San Francisco roads following the state’s cancellation of the vehicles’ registrations. The state took action after Uber refused to seek testing permits, arguing that its cars weren’t “self-driving” because a human being sat behind the wheel. Spammers are increasingly using “hailstorm” attack patterns to get past anti-spam systems. Millions of spam emails, carrying ransomware and phishing emails are blasted out in a very short time from compromised IP addresses all over the world. AT&T has rolled out network-level robocall blocking and spam-call warnings to certain customers who use iPhones and certain Android phones. Subscribers can also block specific phone numbers for up to 30 days. Sorry, no help here for those with landlines. Google has updated its search results ranking algorithm to boost the visibility of “high-quality information” sites and bury Holocaust denial and other hate-peddling sites. Google has also cleaned up its search query auto-completion suggestions to remove some that lead users to such unsavory sites. Alaska became a State on January 3, 1959, and as part of that deal the federal government was to transfer 100 million acres of land to the new State. But only 65 percent of that land has been transferred in 58 years due to the difficulty of surveying land by traditional means. The Bureau of Land Management will use GPS coordinates henceforth, which should cut survey time and costs in half. From the "Words We Don't Say On a Plane" File: A Virgin America flight nearly was diverted when a passenger reported seeing a WiFi hotspot named “Samsung Galaxy Note 7” when he opened his laptop. The recalled phones are banned from U. S. airliners. After the captain threatened an emergency landing if the Note 7 was not surrendered, a prankster confessed to renaming his WiFi identifier. Amazon’s Give Back Box program can be used to ship donations to Goodwill Industries free of charge. Donors can print out a sticker addressed to their local Goodwill by entering their zip code at GiveBackBox.com. From there, UPS or the United States Postal Service will take care of the rest. Plus, all those empty Amazon boxes will disappear! Most recent comments on "Geekly Update - 29 December 2016"
Regarding the quip about AT&T blocking calls: good for them. However I feel that I have a better solution. On my iPhone, I only answer calls from someone in my address book. There is nothing that any other caller can interest me in, so I reject the call, and then add it to the permanent block list. When the phone announces "unknown caller" or a stranger's name, a state, "wireless caller", etc., I don't even pull it out of my pocket until it's time to add it to my permanent block list. Those clowns are wasting their resources on me! Amazon’s Give Back Box program is not only a good way to dispose of the boxes, it also is an invitation to clean out your unused wardrobe and other unwanted items. Plus it helps a worthwhile program and can be used as a tax deduction. Thanks for the "Relaxing playlist" story. I wish they had taken more care choosing the YouTube links though (some of them weren't the best quality). Just what I need is a fast food computer telling me what I should order. No longer have to waste my time looking over the menu to decide what to order. Thank you KFC!! Concerning AT&T robo call blocking when you stated sorry to landline phone users. There is a product nomorobo.com that is free for landline users. It works very well. I saw it reported by CBS on evening news a few months ago. I can tell you what happens if you don't back-up data. Some infiltrates Microsoft and deletes all your photos and documents folders and files. I used Recuva (as suggested by a news letter) and got a lot of stuff back but was it sure messed up. Some stuff is just gone, unless I wanted to send the hard disc to Sydney or Brisbane (I couldn't afford it). So at 1800hrs each Friday, Microsoft updates it for me, M/s has a setting in settings whereby if I plug my external hard drive in before 1800 hrs, it automatically up dates and additions that I have made to the info. pool over the last week. Annoying words: What about: Don't go, away; Will be right back; But wait...; Doctors recommended; and so on. Happy one to everybody! "Get involved and put people back to work". A slogan from Goodwill. Which is a recent peeve of mine. Goodwill gets donations and sells them. The local stores do nothing to refurbish or clean the items that I can tell. The closest location piles items in flat bin tables and you pay by the pound. Not cheap. But people flock to this. I'd rather donate to an organization that gives items to people. And don't start on donation bins, thank you. Happy New Year, Bob. Thanks for your news. AT&T Uverse VOIP has a blocking system you can set up on your computer account. And Panasonic phones now have a pretty sizable memory for blocking after you catch the first one. Caller ID works great at this. Thanks for all the info Bob. I finally dropped my landline because the only calls I got were not for me. The $17/mo phone line ended up costing over $30/mo. Then one of the local cell towers went down (according to my cell company) and I only get cell service for a few hours a day in a couple of location. Not fun! I live 25 miles out of the nearest town, so I better not have an emergency. Google is now burying Holocaust(and other?) denial and hate-peddling sites. My question: When is, in their opinion, a peddling site a hate-peddling site? Where can I get information on their criteria?